To order raw almonds through our local co-op, click here to see our current order forms. 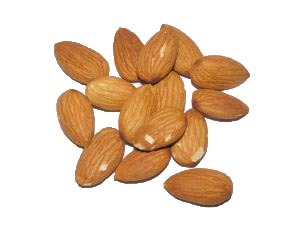 We offer almonds on every order form. If you’d like us to notify you when future orders open, sign up for our emails. We can also ship almonds directly to you. Visit our store to have your order shipped. Our raw almonds will sprout. However, with almonds, you don’t actually get a long root or shoot. The sprout is just a little tiny nub that sticks out from the pointy end of the nut. Sometimes you can’t even see it because the almond skin covers it up. Sprouting almonds is super easy! Here’s how to do it. 1. First, soak your almonds for 4 – 12 hours. Use plenty of water; at least 2 -3 times as much water as almonds. 2. Then drain the soak water. You can use this if you like; it has nutrients in it. Or just feed it to the chickens or throw it out. 3. Now rinse the almonds well and drain again. 4. Place the almonds in an uncovered bowl in a warmish place (your kitchen counter should be the right temperature) to sprout for about 8 – 10 hours. 5. Rinse and drain again. 6. Put them back in their bowl on the counter for another 8 – 10 hours. That’s it! You can stop here or repeat steps 4 and 5 again if you like. Either way, your almonds are ready! Now you can eat them the way they are, use them in a recipe, or dehydrate them to make them crunchy again. Sprouted almonds don’t have enzyme inhibitors in them, so they’re easy for your body to digest. We dehydrate ours and use them in our Sprouted Trail Mix. Yum! If you don’t use all of your sprouted almonds right away, it’s best to refrigerate them. But before you do, spread them out to dry a bit, either in a colander, on a clean towel, or in a shallow pan. They’ll keep better if they’re not wet when you put them away. Use within 2 or 3 days or dehydrate. one more question. says 2011 crop. don’t know lifespan of almonds, but have had some unpleasantly bitter older ones. Do y’all frequently “taste test” them to make sure they taste fresh? Yes, we do taste them frequently. Our family uses the same almonds almost daily, and we haven’t had a bad one yet. I think this is because they’re stored in cold/cool storage and also that our almonds always come from the most recent harvest (which is in October). Also, since almonds are not oily nuts (like walnuts and pecans), they tend to keep better as well. I know what you mean about nasty tasting nuts, and I feel good about telling you ours taste fresh. I hope that helps you out. I was wondering what variety of almonds you have for sale. Hello! Are your raw almonds in the store pasteurized? Do they sprout? When will you have the coop pick up again? Thank you! PS-Do you have any pick ups around Fairview, TN? Thanks! All of our almonds are truly raw, and yes, they will sprout. We have a co-op order going on now. Click the Current Coop Orders button above for details. And yes, we have a Fairview pick up location. when can i buy 2012 almonds? I dont want year old almonds. thanks. We have the 2012 almonds right now. What process is used to shell the almonds?